Size: Trilobite is 3.2" long, 3.7" wide! This is a spectacular trilobite fossil. It is a HUGE Dicranurus monstrosus from Morocco. This amazing specimen was painstakingly prepared under a microscope in the EXTINCTIONS Preparation Lab. Dicranurus is known among collectors worldwide for its unique, spider-like appearance. This awesome specimen is complete and wonderfully prone. This monster of a trilobite has its definitive occipital ''Ram's Horns'' prepared fully free-standing, which makes for an impressive display. The LONG genal and pleural spines just seem to go on forever. 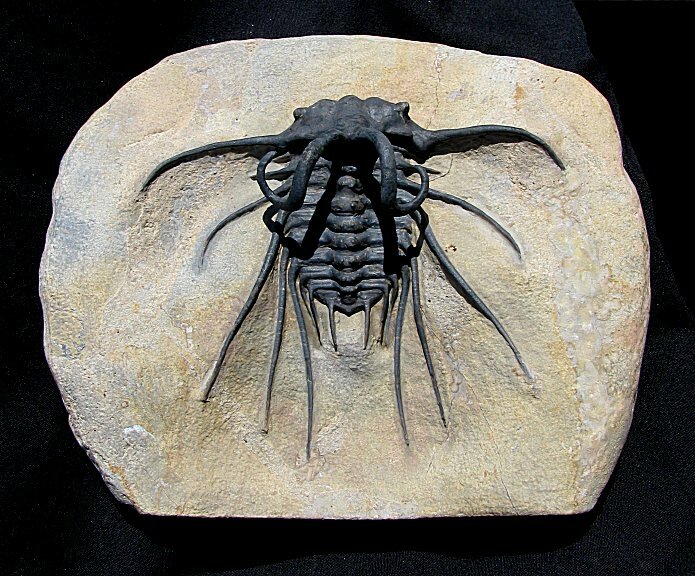 This killer trilobite is beautifully showcased on the large, sculpted block of limestone. This is easily one of the largest and most impressive Dicranurus trilobites we have ever seen.